YSL lippies are widely raved about by beauty bloggers and vloggers alike, and now that I've finally purchased my first one, I can happily join the club as well! After mulling over the YSL counter for ages, I finally decided on the Rouge Volupté Shine in #15 Corail Intuitive, which caught my eye since I'm a sucker for corals (case in point). When it comes to packaging, I really do think its hard to beat YSL. Seriously, how pretty is the gold tube with embossed logo? The lipstick feels expensive... and it is, at $39 CAD a pop. But fans swear it's worth it and I have to admit that I'm starting to buy in too. 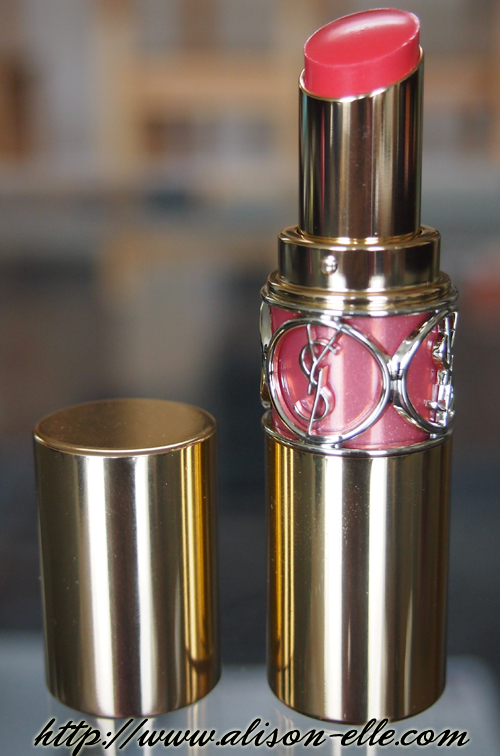 Unlike the more opaque Rouge Volupté lipsticks, the Rouge Volupté Shines are more shiny (obviously) and fairly sheer. On my pigmented lips, Corail Intuitive imparts a faint hue that is slightly lighter than my natural lip colour, making it an easy-to-pair shade and perfect for minimal makeup days. The formula feels hydrating and applies well, plus it smells like tropical fruits which is a big bonus in my books. Personally, I do prefer more pigmented lipsticks on an everyday basis since I like a bit more colour so I will be trying the regular Rouge Volupté line next. Don't get me wrong though - I do love this one too... and it was the perfect introduction to what feels like the start of a very expensive new habit! This is such a pretty colour! I quite like the fact that it's sheer, especially for this time of year. I love the packaging too, it's so luxurious. I almost want to get one so I can have ONE of their practically art work lipstick tubes! It looks so smooth on your lips! Haha, that was my thinking too though it may lead down a rabbit hole of needing to collect them all. You could cash in your Shoppers points at Murale to get one! Very pretty! Did you find that it settles into lines at all? That's always my problem with lighter colored lipsticks. Not so much with this one. It's more of a balm, kind of like those Lise Watier Rouge Fondant Supreme lippies. I was thinking maybe Peach Passion! So many good colours to choose from though! I like how it's sheer!! Such a pretty pink hue too! This color looks gorgeous! I am looking for a nice coral lipstick and this might just fit what I'm looking for. I do love the Volupte Shines because I'm a little color shy! I feel like every single lip color looks good on you! The YSL packaing isss to die for! I have this and the color isn't great on me but I like it on you! Be careful ... they are addicting. I started off with 1 in November and now have 6. Yikes! Ah, I already want them all even if I wouldn't wear them. They are too pretty!